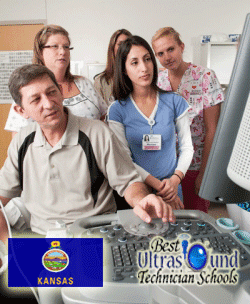 In Kansas there are three institutions of higher learning that provide ultrasound technician programs accredited by the Commission of Accreditation of Allied Health Education Programs (CAAHEP). One of the three, Labette Community College (LCC), is the only two-year institution; it is located in the small southeastern Kansas city of Parsons. The other two are four-year public universities: Lawrence-based University of Kansas (the state's largest university) and Washburn University, which is based in Topeka (the state capital). LCC, Kansas, and Washburn offer a Certificate in Diagnostic Medical Sonography. At Washburn, students can choose any of the three following specializations: General Sonography, Cardiac Sonography or Vascular Sonography. Thus while General Sonography students expect to be trained on a more holistic level, Cardiac students mainly focus on diagnostic imaging of the heart and Vascular students concentrate on blood vessels. Depending on the specialty, the Washburn program can be the shortest, at 12 months (one year) for the Vascular or Cardiac track; it is 22 months for the General concentration. The programs at LCC and the University of Kansas are split into five semesters and designed for completion within 21 months (1 3/4 years). Due to the varying lengths of the programs, the number of clinicals also vary. For instance, students taking Washburn's Cardiac or Vascular track take three, while students at other programs are required to take five. The University of Kansas in particular places emphasis on completing certain courses as a requirement for admission. They include subject areas such as mathematics, oral communication, physics, biology, and English. The U.S. Bureau of Labor Statistics (BLS) reports that the median yearly income for diagnostic medical sonographers in Kansas was $65,700 ($31.59 per hour) in 2012. The bottom 10 percent of sonographers in the state had a median salary of $49,200 ($23.66 per hour), while the top 10 percent earned $87,800 ($42.23 per hour). The BLS estimated that there were 570 diagnostic medical sonographers in Kansas in 2010. The agency expects a 43 percent job growth between 2010 and 2020; this will bring the number of professionals up to 820.